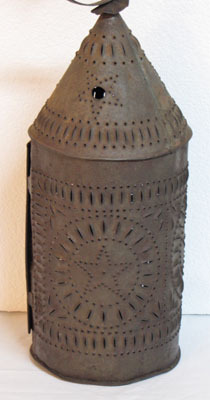 Rare star pattern punched tin lantern has a clinched candle cup through the bottom, original hanging ring, and hinges and latch in fine working order. It does have a couple of small dents along bottom edge from use. One of the larger early barn lanterns, dates 1800-1820. One of the earliest ones we have had.